One Japanese student saw the descending pattern in the bass line. After studying the music, he also noticed a predictable pattern in the melody and chords. From as early as week two, I get my students to learn that music, like math, is all about identifying and recognizing patterns. Click on the sample score below to get the two-page PDF score. 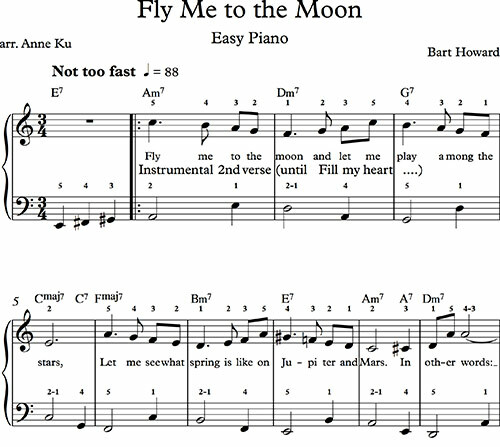 For other “easy piano” arrangements, visit the Music section of this website. This, to me, is a feel good song with feel good associations. The Frank Sinatra version of it was “the first music ever heard on the Moon”. This 1964 version was played on a portable cassette player by Buzz Aldrin after he stepped on the moon during the Apollo 11 mission. It was also played when the Apollo 10 mission was orbiting the moon during it’s mission. It was also on the Space Cowboys soundtrack.